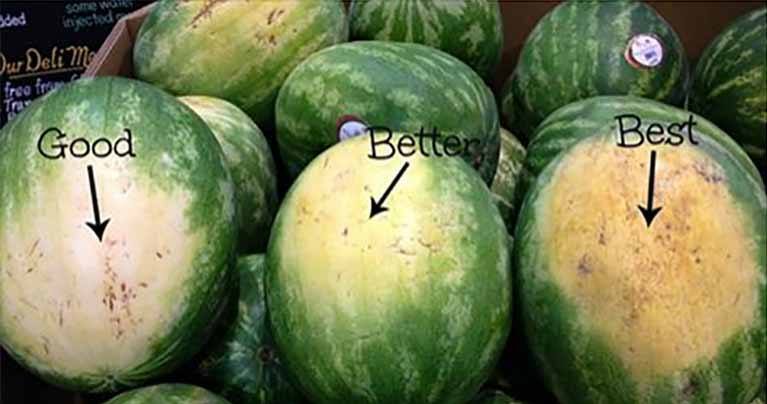 When it comes to picking a watermelon, you have all noticed the weird white spots on them. These spots are quite natural and they are the area where the watermelon rested on the ground. Always pick those watermelons with creamy-yellow or orange-yellow spots. Also, do not avoid the ones with a gold spot. The brown, coarse marks on the watermelons are results of the pollination process. The more pollination there was, the sweeter the watermelon is. So, the webbing on watermelons indicate their sweet and delicious taste. As a result of the gender you can find ‘boy’ and ‘girl’ watermelons. The ‘boy’ watermelons are taller and more extended while the ‘girl’ ones are round and stout. The ‘boy’ watermelons are characterized by a watery taste while the ‘girl’ ones are sweeter. The size really matters when it comes to picking the right watermelon. You might think that the biggest watermelon should be the best. In fact, the best watermelon is average-sized. Make sure you do not pick the big but the right ones. Watermelon’s tail points out its ripeness. If it has a green tail, it was picked too soon and might not have a good taste while the good ones have dried tails. When picking a watermelon, make sure you follow these tips because the shell is an important indicator of its taste.